3D scanning lets historians digitally preserve cultural artifacts threatened by extremist groups. 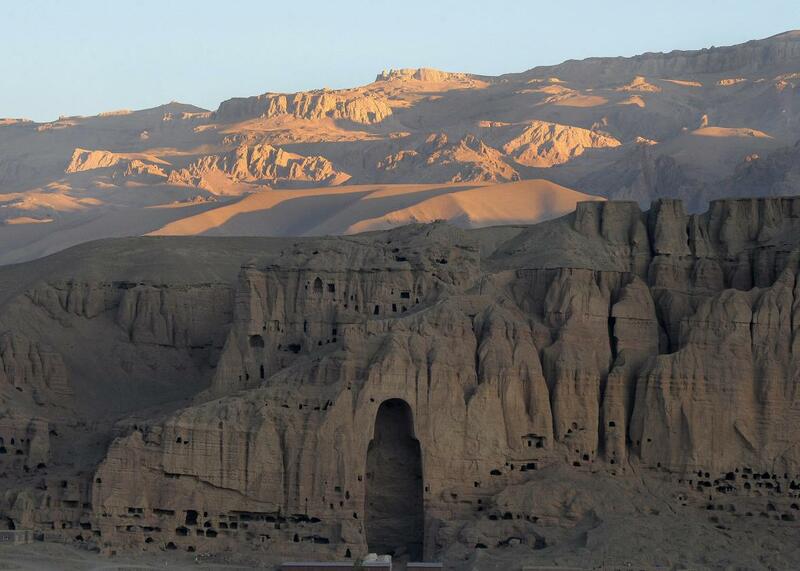 This photo, taken in 2008, shows the cave-monasteries of Bamiyan and the niches where the 174-foot Buddhas, which were destroyed by the Taliban, once stood. This post originally appeared on The Conversation. On Thursday, Jan. 28, Future Tense—a partnership of Slate, New America, and Arizona State University—will host a happy-hour conversation in Washington, D.C., on using technology to preserve antiquities. For more information and to RSVP, visit the New America website. In March 2001, the Taliban blew up the Bamiyan Buddhas in Afghanistan, two of the tallest Buddha sculptures in the world. This horrific attack on an important and beautiful example of the patrimony of central Asia shocked the world. It also forever changed the landscape of cultural preservation, archaeology, and global heritage. Even back then, we had some of the 3D-scanning technologies that could have allowed us to digitally document and preserve the Buddhas. We did not yet anticipate the scale of destruction that would leave hundreds of global heritage sites damaged or obliterated in the 15 years since that event. The loss of this cultural heritage has spurred teams of researchers and nonprofit organizations to race to make 3D scans, architectural plans, and detailed photographic records of heritage sites around the world, knowing they could be destroyed at any time. Advances in 3D-scanning technologies, drone use, and even tourists’ online posting of images are giving preservationists a new set of tools to prevent the permanent loss of cultural artifacts. In the 1990s, several international heritage organizations were created to highlight the importance of cultural heritage to history, tourism and ethnic identity. One such group is UNESCO’s World Heritage Centre, founded in 1992. The archaeological and heritage communities cheered these efforts at preservation of important places, sites, buildings, and landscapes that were being threatened or destroyed by expanding cities, hydroelectric projects, coastal erosion, and other perils. Just last week the destruction of a sixth-century Christian monastery in Iraq caught the attention of the world. This is just one in a long list of sites destroyed by ISIS that began in 2014 and caught the attention of the world with the February 2015 video release of the destruction of the Mosul Museum, where some of the most important early Assyrian sculptures were housed. Project Mosul, created one week after the video was released, is the brainchild of Chance Coughenour and Matthew Vincent, Ph.D. student researchers in Europe’s Initial Training Network for Digital Cultural Heritage. They scoured the Internet for photographs of the sculptures and artifacts, crowd-sourced for tourist photos, and collected images from U.S. military personnel who had visited the museum. That material became the basis for the digital reconstruction of the destroyed artifacts using basic photogrammetry. This technique uses photos from multiple angles of the same object to construct a 3D model of it. The destruction of Buddhist sculptures in Bamiyan led to an early success in digital preservation: Fabio Remondino of the Bruno Kessler Foundation in Trento, Italy, used photogrammetry among other techniques to digitally reconstruct the Bamiyan Buddhas. The effort is spreading. The Zamani Project from the University of Cape Town has spent the last 12 years documenting Africa’s most important cultural and heritage buildings, sites, and landscapes. Importantly, its data are freely available and accessible. The Democratization of Science project at the newly formed Center for Virtualization and Applied Spatial Technologies located at the University of South Florida has a similar mission: documenting, preserving, and protecting the world’s cultural and natural heritage through the use of digital visualization and 3D virtualization. And like the Zamani Project, it will democratize science by delivering digital data and heritage resources to the global community. Our project at the University of South Florida is using 3D imaging to scan entire museum collections, archaeological sites, and ancient landscapes around the world. Sites and collections are chosen based on their research potential and need for preservation. Projects and laboratories with similar missions are beginning in many universities and research centers, especially in the United Kingdom, Italy, and Spain. However, the development of high-resolution 3D laser scanners has made the largest impact. This equipment aims laser beams at surfaces, records the reflected light, and assembles a very sharp 3D image of the space. Combining all these, we now have the tools to digitally preserve what extremist groups would like to destroy. The attempts to destroy some of the world’s heritage have had quite the opposite effect: an entirely new area of research and scientific practice that has transformed archaeology, heritage, paleontology, museum studies, architecture, and a suite of other disciplines. Equally relevant is the new emphasis on the democratization of knowledge through the digital availability of these data. Now any student, scholar, or interested individual has access to some of the most important historical and archaeological specimens, buildings, and cities in the world. These efforts bring our global cultural heritage to everyone, while helping to ensure the preservation of our heritage in an increasingly hostile world.